Besides Spanish, my two other main passions are my family and art. I managed to combine all three during a trip to New York’s Museum of Modern Art (MoMA) this past week with my husband and in-laws. 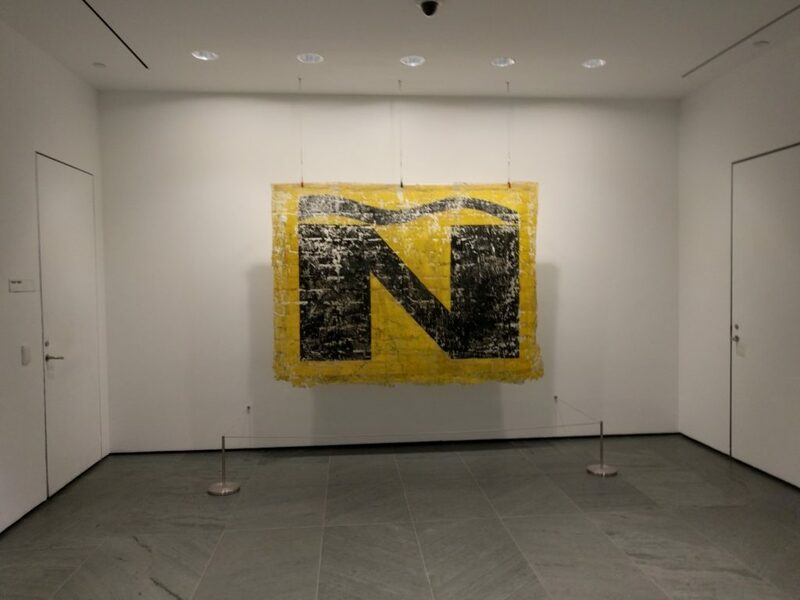 At the foot of the main escalator — a prominent position — the museum had hung a new acquisition: a giant painting of the Spanish letter ñ, or eñe, by the Peruvian painter José Carlos Martinat. The picture below shows the painting with its surrounding wall space so that you can see its scale (about 6 by 8 feet). For a closer view, please visit the relevant page on MoMA’s website. It is scandalous, to say the least, that the European Economic Community has dared to propose that Spain eliminate the letter ñ of our alphabet, and even worse, only for reasons of commercial convenience. The authors of such abuse and arrogance should know that the ñ is not an archaeological relic, but the reverse: a cultural leap by one Romance language that left the others behind, expressing with only one letter a sound that in other Romance languages continues to be expressed with two. 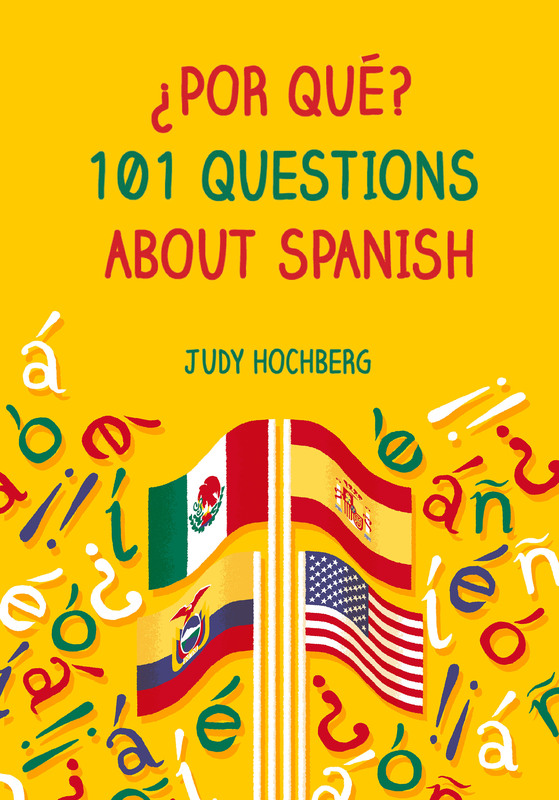 Therefore, the logical thing is not for Spain to renounce a letter that even forms part of its own name, but that the other languages of the European paradise modernize themselves by adopting the ñ. On the other hand, as an art lover, I understood the painting as an example of “appropriated art”, a current in modern art in which “found images”, not originally intended as art, are reproduced, often with changes in color and size, as a deliberate artistic expression. The most famous example is probably Andy Warhol’s Campbell’s Soup Cans paintings. José Carlos Martinat’s practice frequently involves appropriating images and texts from the public sphere and recontextualizing them in mixed-medium works and sculptural installations. Between 2009 and 2013, he produced the series Pintas (Impressions), in which he removed street graffiti with advertising, political slogans, or candidates’ names — in the case of this work, that of the former mayor of Lima, Luis Casteñeda. After applying a resin-based medium onto a painted wall, Martinat would peel off the imprint and its material support, creating a new and autonomous image of a single letter or word. Taken out of context and installed in a museum space, the extracted fragment is activated in new ways as a signifier of language, politics, and public space. A residual image of what was previously a word or a phrase, Ñ speaks to the erodible, changeable nature of language and speech, whose users introduce fluctuations that ultimately transform communication itself. As a distinctive letter from modern Hispanic alphabets, “ñ” is also a differential sign, one that indicates otherness in relation to the global hegemony of English. This entry was posted in The written language and tagged eñe, Gabriel García Márquez, José Carlos Martinet, MoMA, Spanish alphabet, tilde on 12 March, 2017 by jhochberg.